Put your couscous in a bowl, then pour over just enough boiling water to cover it. Set aside for 3 minutes to allow the couscous to soak up the water. Slice the salmon widthways into finger-size strips, drizzle with olive oil, and season with pepper and a small pinch of salt. Heat a small non-stick frying pan and add the salmon strips on their side. 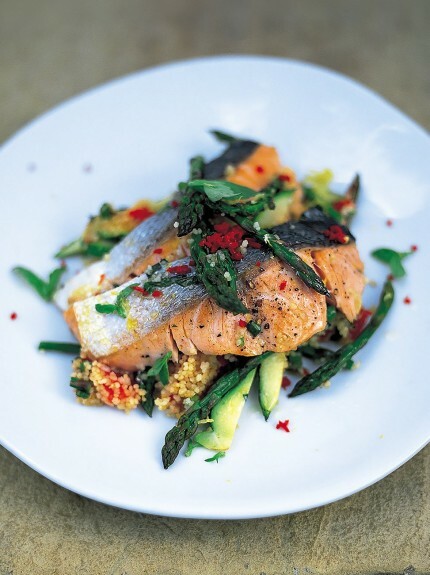 Scatter over the courgette, asparagus tips and chilli and cook for 2 minutes, turning the salmon over halfway.